Point Pleasant sophomore Justin Cornell locks in a hold during a 106-pound match against Huntington held on Dec. 6 at Point Pleasant High School. Wahama senior Ethan Herdman locks in a hold during a 152-pound match against George Washington on Friday night at the 2017 Jason Eades Memorial Duals held at Point Pleasant High School. POINT PLEASANT, W.Va. — Three points made all the difference. 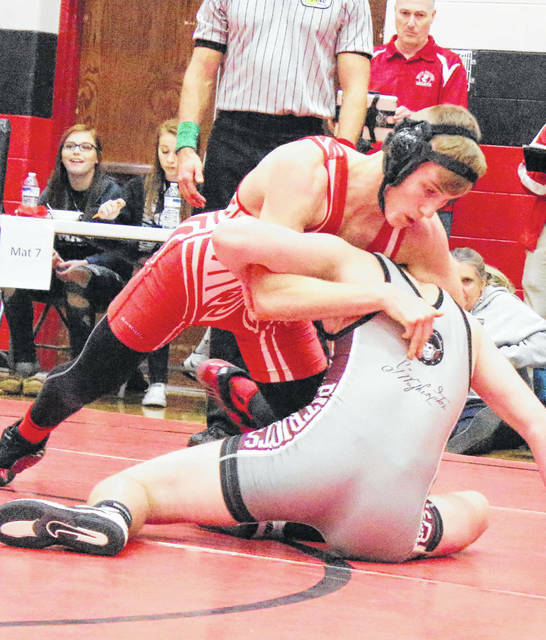 The Point Pleasant wrestling team came away with runner-up honors at the 12th annual Jason Eades Memorial Duals held Friday and Saturday at Point Pleasant Junior-Senior High School in Mason County. The Big Blacks — the defending champions of their own tournament — finished 7-1 overall during the two-day event, with the lone loss coming to eventual-champion Greenbrier East by a narrow 36-33 margin. George Washington was third overall, while Cabell Midland and Musselman rounded out the top five spots in the final team standings. 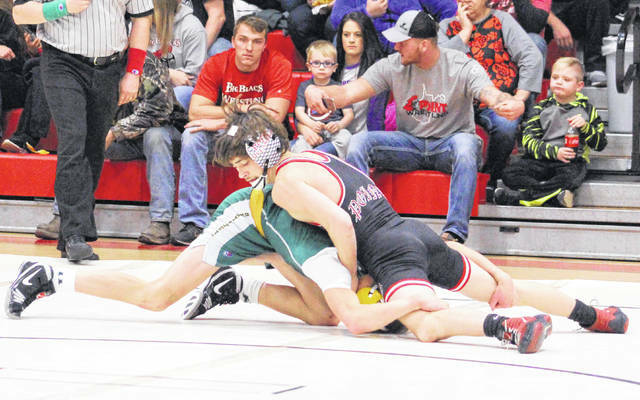 Point Pleasant cruised through the opening day of matches after posting wins over Shady Spring (70-3), Grafton (66-13), Lincoln County (69-9) and Nicholas County (75-6), then the hosts notched a 78-6 decision over Calhoun County. Greenbrier East — who finished second last year at the Eades tournament after dropping the final head-to-head match to PPHS — exacted a little revenge this winter with its three-point victory, the same margin that the Spartans lost by a year ago. Point went on to win its final two duals after posting a 50-15 win over Cabell Midland and then secured a 43-34 victory over George Washington. Following the event, PPHS coach John Bonecutter noted that his young troops wrestled well — but they also made a few mistakes that made the difference between first and second place. The Big Blacks had five different grapplers finish the weekend unbeaten, including a pair of 8-0 efforts from Justin Cornell (106) and Juan Marquez (195). Mitchell Freeman ended the event 7-0 after splitting time between 120 and 126 pounds, while George Smith (120-126) was 4-0 and Christopher Smith (106) went 3-0. Point Pleasant had eight wrestlers end the two-day event with a single loss, with Isaac Short (113) and Zac Samson (145) each going 7-1 in their respective weight classes. Parker Henderson was 5-1 at 106 pounds, while Caleb Lane was 4-1 overall wrestling between the 120- and 126-pound divisions. Nick Ball and Dakota Moses both went 3-1 between the 220- and 285-pound weight classes, while Jacob Muncy was also 3-1 overall in the heavyweight division. Wyatt Stanley was also 2-1 going between the 220- and 285-pound divisions as well. Riley Oliver (132), Wyatt Wilson (138), Clayton Hill (182) and Tre Craddock (285) each finished the weekend 6-2 overall, while Jacob Bryant went 4-2 at 170 pounds. Jake Roub (152) and Logan Southall (160) both went 5-3 in their respective divisions, while Nazar Abbas was 4-3 at 170 pounds. Colton Carr was also 1-6 at 170 pounds. Wahama also competed at the annual event and had one grappler go unbeaten as Ethan Herdman posted an 8-0 mark at 152 pounds. Christian Thomas (170) finished 7-1 overall, while Braden Weaver (285) was 5-1 and Antonio Serevicz (220) went 4-1. Trevor Hunt was 5-2 at 132 pounds, while Wes Peters went 5-3 at 160 pounds. Emma Tomlinson posted a 3-5 mark at 106 pounds and Shawn Taylor was 2-6 at 195 pounds. Ethan VanMatre and Trey Peters both went 1-3 at 126 pounds, while Jase Heckaman was 0-1 at 160 pounds.